Teams must immediately get over the shock of a zero-hour Pit Stop and their exhaustion from Leg 3 to immediately begin this one. Teams must leave the Kok Tobe Apple and find the Kok Tobe Arch. They will find a path that will lead them to a clearing where they will be greeted by Mongol warriors. They will then receive a clue from a Golden Eagle at the foothills of the Tien Shan Foothills. Kyz Kuu is a traditional equestrian sport in Kazakhstan in which a young man and young woman, both on horseback, race. The man attempts to steal a kiss from the woman by leaning over on his horse. The woman then rides around and “whips” the man. For this task, teams must learn and perform a routine which includes both acts to receive their next clue. 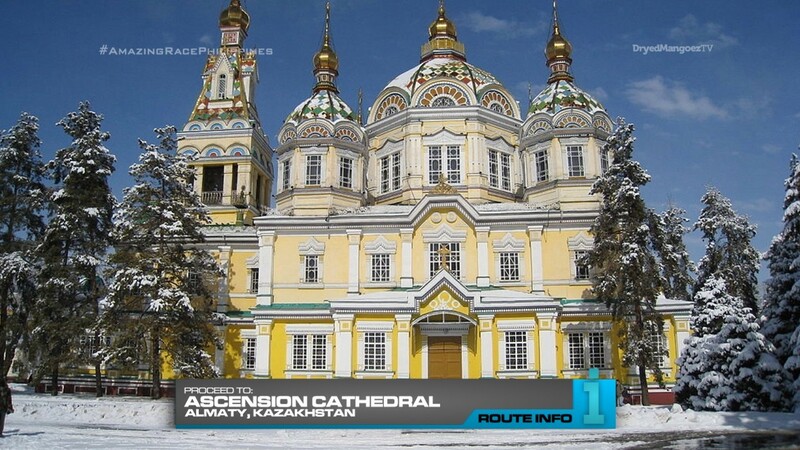 Teams must now return to their brand-new 2016 Kia Sportages and drive themselves to the Ascension or Zenkov Cathedral. 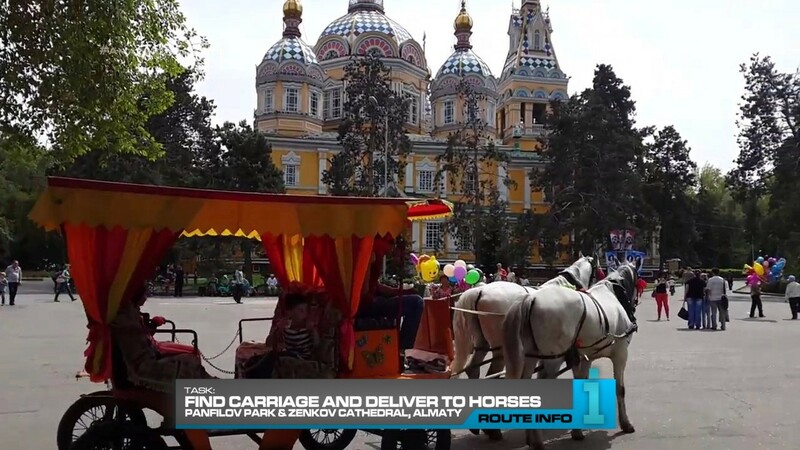 The clue here tells teams to search the adjacent Panfilov Park for a carriage. They will need to pull it back to the front of the cathedral and attach it to two horses who will give them their next clue. 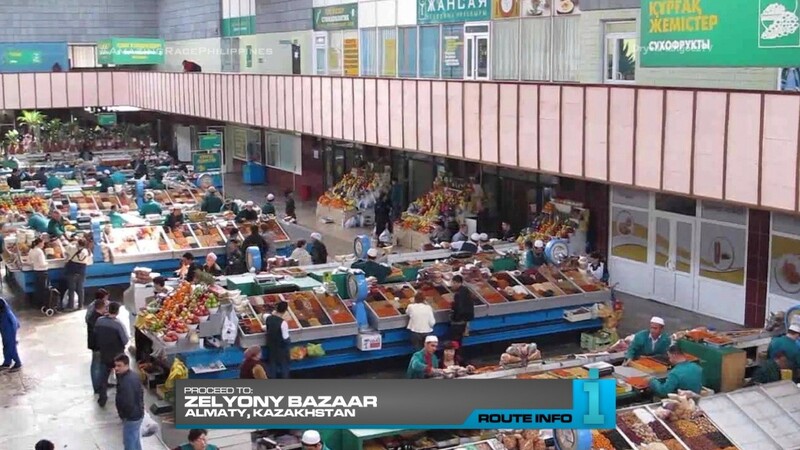 Teams must make their way on foot to Zelyony Bazaar. And outside the market, they will find the Detour: Perfect Display or Perfect Cut. 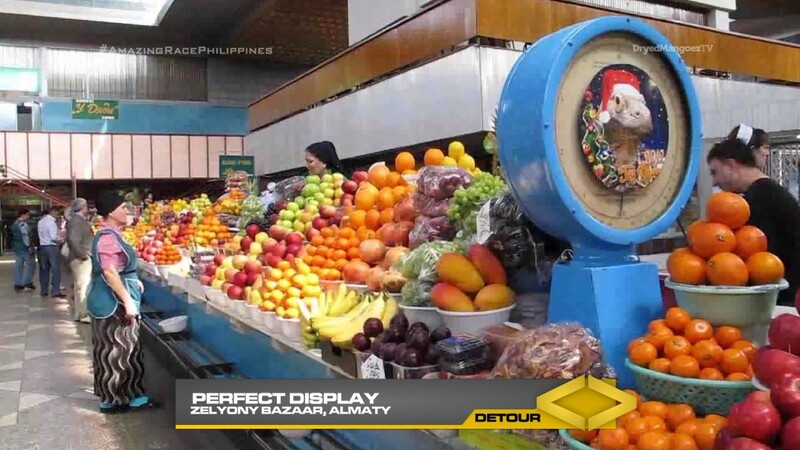 In Perfect Display, teams must unpack a delivery of fruits and set-up a market display according to a provided example. Once their set-up is an exact match, they will be given the next clue. 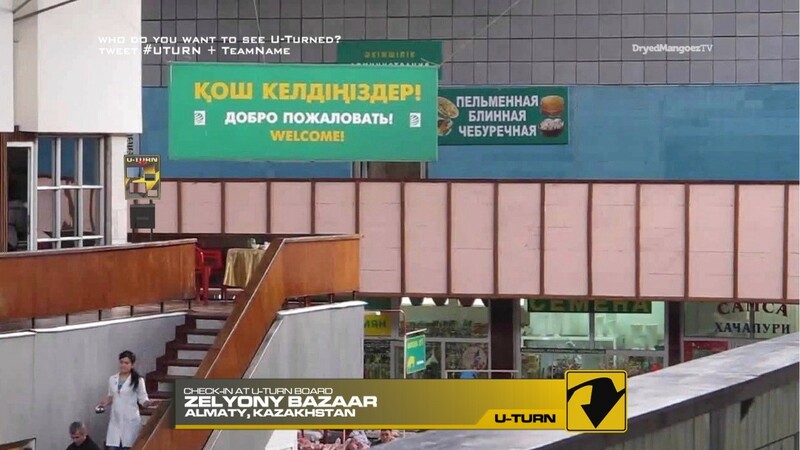 In Perfect Cut, teams must head to the meat section of the market and cut a section of horse meat, the most popular meat in Kazakhstan, for a waiting customer. Once they have given the customer their order, they will receive the next clue. And that clue directs teams to search the market for a Double U-Turn board! And next to the Double U-Turn board is the clue pointing teams to the Pit Stop at First President’s Park. The last team to check-in here WILL unfortunately be eliminated. If the last Leg was a wintery/winter sports Leg, this is a city Leg. And Almaty should have lots of interesting possible tasks to do beyond what I’ve included here. Like I mentioned in the last Leg, since teams would have to be visiting here in the cold months, I don’t know if the Kyz Kuu would be possible in snow. It would certainly look stunning in great 4K HD (a first for Philippine television woohoo! lol). In my original outline of the Leg, I had the Kyz Kuu at the end, but then I saw that the foothills of the Tien Shan are the perfect location for such a task. 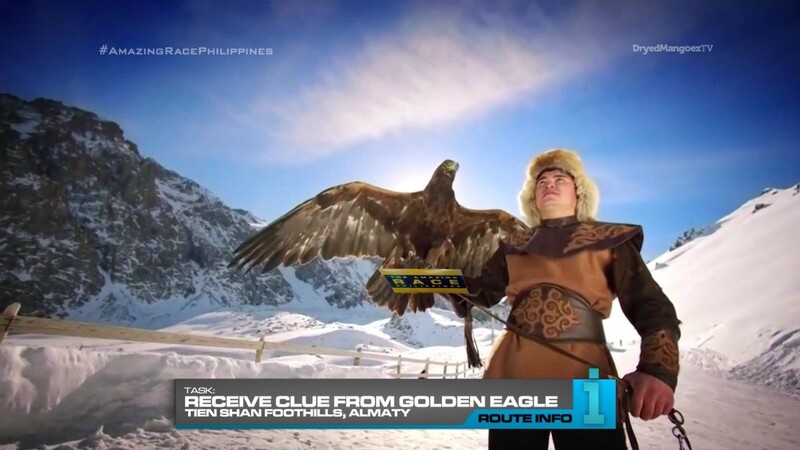 And I wanted to include that Route Marker from TAR13 where teams got their clue from a golden eagle. Especially since the location was apparently near the Kok Tobe Apple Pit Stop of the last Leg here. Perfect for a zero-hour Pit Stop. The carriage task just gets teams to do something in the park and in front of the cathedral, which is another visually stunning location. Especially in snow. The Detour is made up of typical TAR tasks. And after a full 24 hours of Racing, we can ease up a little for the last task of the Leg. Typical tasks, but certainly not easy though. 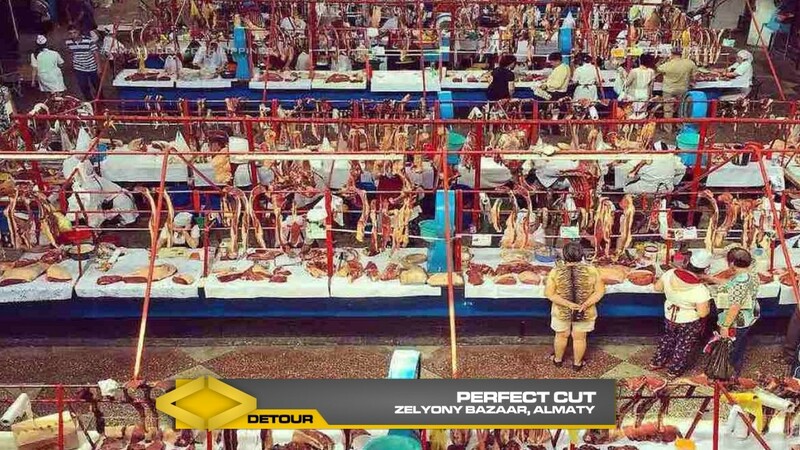 The horsemeat side of the Detour should be an interesting experience as well. But not only that, there’s the possibility of the Non-Eliminated team from last Leg already having a U-Turn. So how does that work? That team of course can’t be U-Turned twice. But they could certainly U-Turn another team if they reach it first. Now that should be very interesting! Lots of drama potential there. 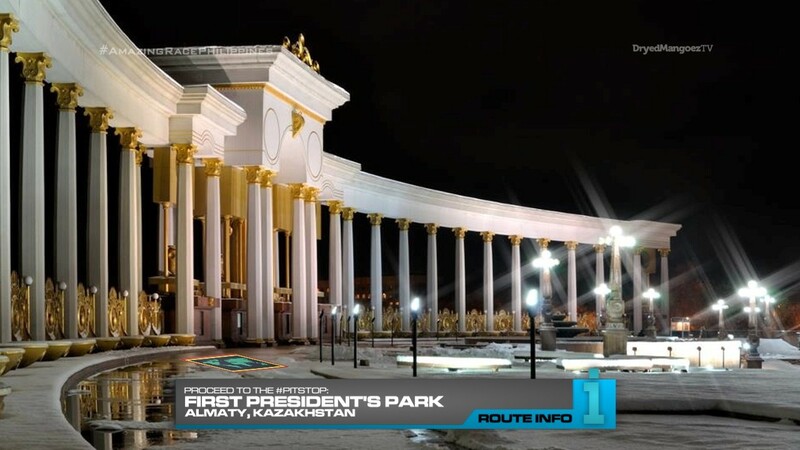 And finally, First President’s Park is a must-have location. Kazakhstan should hopefully produce two exciting Legs.